Amended Civil Code Section 4775 Clarifies Responsibility for Exclusive Use Common Area — Has Your Association Adjusted to The Changes? Many California community association’s CC&Rs, particularly those in older communities, do not clearly state who is responsible for the repair or replacement of exclusive use common area. This typically relates to the waterproofing of patios and balconies at most condo associations. That is the exclusive use area defined in the CC&Rs that requires repair and/or replacement (for most condominium associations, exclusive use common area is limited to balconies, patios and parking spaces). Before January 1st of 2017, there was some uncertainty as to who is responsible for the repair or replacement of exclusive use common area which led to disputes between associations and owners. Fortunately, amended Civil Code Section 4775 helps clarify this issue. If the CC&Rs are not clear, we look to Civil Code Section 4775. That section, like former Civil Code section 1364, its predecessor, had since the mid 1980s provided that the association is responsible for repairing, replacing, or maintaining the common area, other than exclusive use common area, and the owner of each separate interest is responsible for maintaining that separate interest and any exclusive use common area appurtenant to the separate interest. The owner of each separate interest (unit or lot) is responsible for maintaining the exclusive use common area appurtenant to that separate interest. The association is responsible for repairing and replacing the exclusive use common area. This revised language clarifies who is responsible for maintenance and repair/replacement of exclusive use common area. 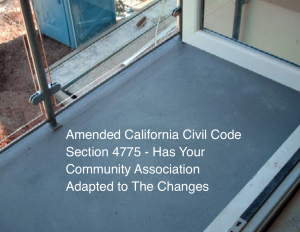 The net result of clarified Civil Code § 4775 is that California Community Associations will have to accept repair or replacement responsibility for exclusive use common area components that in the past were (incorrectly) assumed to be the owner’s responsibility. Associations will need to review their reserve and operating budgets to make sure the added repair expense is budgeting for and included in the annual assessment calculation. The above is a summary of the entire article by David Swedelson on amended Civil Code Section 4775. To download the entire article, click here. David Swedelson is a senior partner at SwedelsonGottlieb that limits its practice to the representation of California Community Associations. David can be reached via email at dcs@sghoalaw.com.